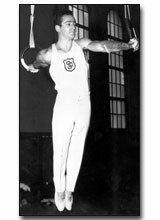 George Wikler was one of the country's leading gymnasts during the late 1940s-1950s. He began competing as a Roosevelt High School student, and concluded his career in the late 1950's, while attending the USC School of Pharmacy. At Roosevelt High, Wikler was the City silver medalist in the rings event (“swinging” and “still” rings). In 1949, attending Los Angeles City College, he took second place in the same event at the National AAU Championships. Finally in 1950, Wikler won the National AAU gold medal. While serving in the United States Coast Guard, Wikler won the National AAU Championship in three successive years, 1952-53-54. In 1955, as a USC School of Pharmacy student, he was a gold medalist at the NCAA Championships. For his gymnastic and academic accomplishments, Wikler was elected a member of USC’s Skull and Dagger Honor Society. He is also honored with a plaque at USC's Heritage Hall.